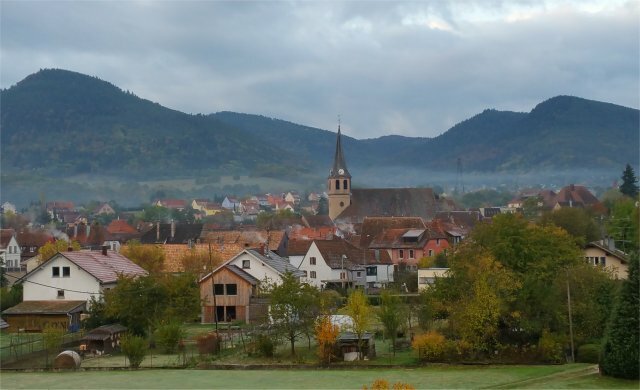 Just a week after returning from Santorini, I was waking up to a very different view from the bedroom window – green, misty and with a touch of frost on the ground, the Vosges mountain range in the background rising over an Alsace village, Villé to be precise. Another beautiful European wine region, but so, so, different. 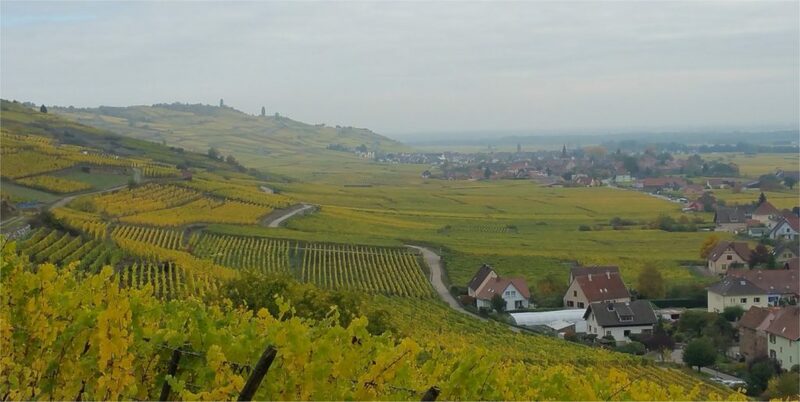 In fact the Alsace vineyards could hardly be more different, with neat rows of lush vines in fertile soil, just starting to take on autumnal colours. When you see how different the regions are, it seems almost incomprehensible that both Alsace and Santorini are capable of producing good wine. But they are, and do. As in my last post on Santorini, I am not going to attempt anything too systematic here. 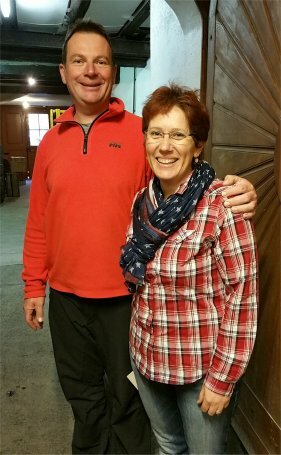 In Alsace I tasted over 120 wines and visited nine producers, but I am just going to mention two of the most memorable visits – the one that stood out at the time when I experienced them. We were welcomed warmly, and treated to a tasting by Madame Schaeringer. She is the wife of Jean-Luc (both pictured here), who took over the company from his uncle in 1996. The wines that impressed me most were a couple of Rieslings, Steinacker de Ribeauvillé 2014 and A mon grand-père 2013, and the Equilibre Pinot Gris 2014. What I liked about all the wines, and these in particular, was the understated elegance and complexity, the Rieslings already seeming to show hints of maturity. And very reasonable prices, each of my favourite three wines coming in under €10. We said hello to Jean-Luc as he packed our order, and had a quick look round the winemaking room where fermentation was in full swing in most of the tanks. Incidentally we had already had a discussion with Madame (I really must learn to be a better journalist and get names), who was keen to improve her already excellent English and amongst other things learn the correct terms for the various winemaking vessels. We reached an uncertain consensus that rectangular stainless steel ones were probably best called tanks. I was also interested to see a bucket – if that is the right term, as I think this was rectangular too – of warm liquid yeast culture, ready to be used in the next batch of must. Didn’t realise it was done like that. Oh, and along with our order we were slipped an additional bottle, which was drunk with our evening meal. I also enjoyed that one a lot. On the label was Minori, Rizling, Ribo’bulles. Make of that what you will. I think it was a pét-nat. In other words, a wine with a slight sparkle created by bottling before the fermentation had completely stopped. No sulphur and, as evidenced by the cloudiness, no filtration,. It reminded me of apple pie, complete with cinnamon, pastry and cream. Different, interesting, and good. I had never encountered Xavier Wymann wines before, and as far as I know they are not available in the UK . Ernest Burn was a little more familiar, but until I visited I did not know what strength in breadth they had. Here was a very different tasting experience. No intimate tasting room, nor chatting about tanks and Brexit. There was a large area with several tables, surrounded by foudres, and no one representing Ernest Burn at our table as our host was mainly occupied with other people. But we had a very generous tasting, where bottles were just brought to the table with minimum introduction, and we were trusted to pour for ourselves. It is nice to hear what a producer has to say, but there are also advantages to being left to your own devices, as it is easier to concentrate on what is in the glass. 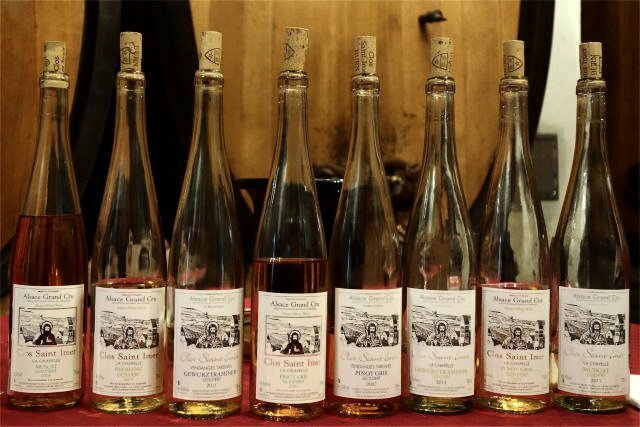 The number of different wines produced was a lot larger than Wymann, so we focussed more – on the cuvées from Clos Saint-Imer, in the Grand Cru of Goldert. They all looked enticingly golden in their clear glass bottles. Was it a deliberate marketing decision to play on the golden colour of the wine and the name of the Grand Cru? So many of these wines were of excellent quality, and together they made for a wonderful tasting. VTs and SGNs apart, all the Clos Saint-Imer wines were €18, which I thought represented good value. I don’t want to mention them all, but for me the Pinot Gris 2007 particularly stood out. In fact, if I were to nominate a Wine of the Trip that would probably be it. Intense, mature, spicy. Off dry but with high balancing acidity, so overall it left the mouth with a refreshing tingly feeling. Wonderful stuff. This entry was posted in My tasting notes and tagged alsace, france, tasting, tasting note. Bookmark the permalink.